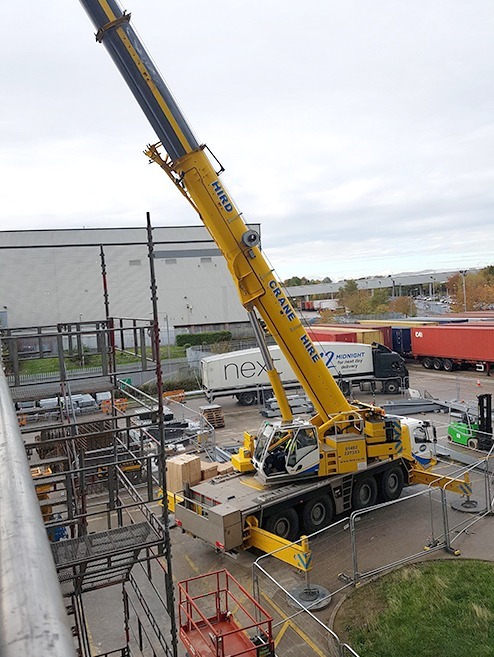 Lifting specialist Hird has used its 100-tonne mobile crane to lift two Maeda spider cranes into an upper level of a distribution warehouse being built for a major clothes retailer. 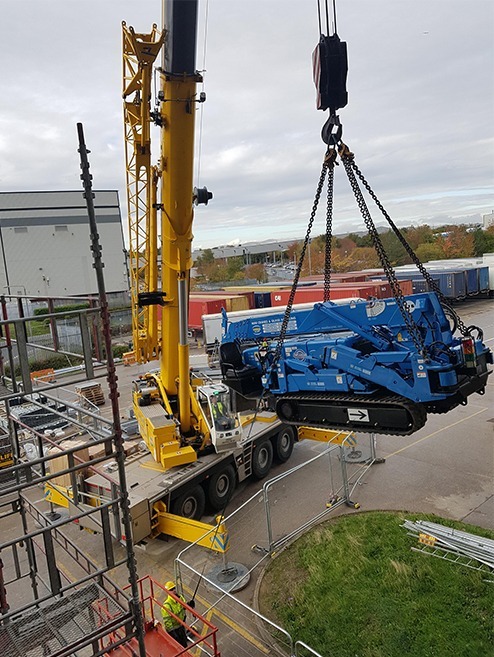 The Maeda MC305 mini cranes have been hired to support the installation of conveyors and stairs in the new logistics hub near Wakefield in West Yorkshire. 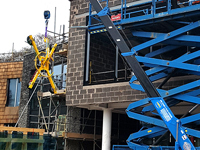 To complete these tasks, the spider cranes must be operated from a floor eight metres up inside the building, so Hird lifted them into position with its Grove GMK 4100L mobile crane. Two specialist light-weight electric scissor lifts were also lifted into position to support the work. 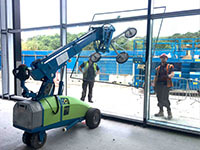 Hird Lifting Manager Mick Bradshaw said: “The curtain wall of the building has been left off to allow us to lift the spider cranes and scissor lifts into and out of the building. The MC305 spider cranes are being shared by two contractors, one installing conveyor systems, the other fitting out staircases across the building. 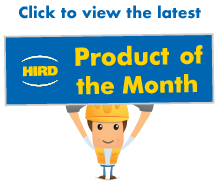 Hird has trained two members of the conveyor fit-out team to become qualified mini crane operators, while Hird operators will support the contractor installing the staircases. Mick Bradshaw said: “The operation was carried out as a contract lift, with Hird drawing up a risk assessment and method statement and overseeing the lifting in of the spider cranes. Lifting across low load-bearing floors is a key requirement for both contractors, which is where spider cranes come into their own. The MC305 tracked spider crane is just 1208mm wide and weighs only 3.9 tonnes. Point loading is reduced further still when the crane’s four outriggers are deployed in lifting mode. 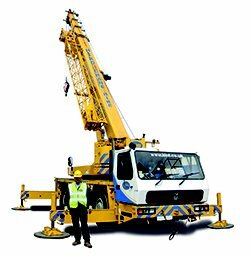 The crane delivers a maximum safe working load (SWL) of 2.98 tonnes at a radius of 2.5m, and a maximum radius of 12.16 metres, at which distance it has a SWL of 260kg. With boom length set to 3370mm, the mini crane has a four-cable fall of 16.09 metres. With a powerful two-speed winch, cable remote control, and a range of sensor alarms, the MC305 delivers productive and safe lifting. As an electric mini crane it also delivered emission-free lifting, which was needed in the enclosed space, with powerful batteries that deliver long operational cycles. This makes the crane productive and sustainable. Hird’s GMK 4100L mobile crane has a maximum lifting capacity of 100 tonnes. With a 60 metres boom, it has excellent reach, and can lift up to 1.6 tonnes at a radius of 48 metres. 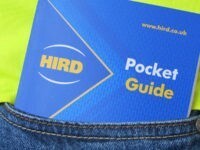 For more information about mini spider crane hire, mobile crane hire, mini crane operating training, and contract lifting support, call Hird today. All our services are available nationally via our three regional operating hubs.